A great gift for any Frida Kahlo fan or folk-art lover! This decorative Frida Kahlo doll ornament is approximately 8 3/4” tall, 3 1/4” wide and will look great on a personal altar, bookshelf, or in a shadow box! 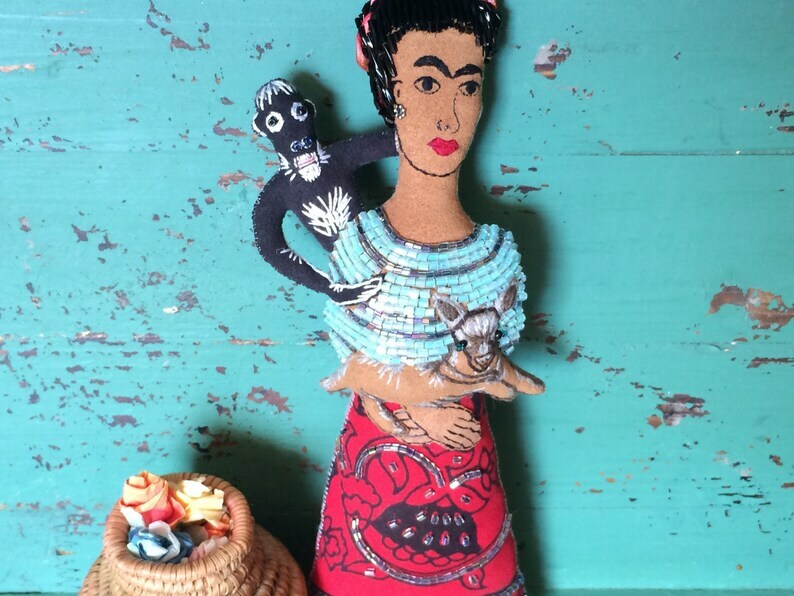 This Frida is inspired by Kahlo’s 1945 painting “Self-Portrait with Small Monkey.” I made her individually by hand, and she is my original design. She is wearing her hair in a ribbon-wrapped braid and is dressed in a beaded skirt and blouse made from recycled fabric, with a silver earring in her ear. She’s carrying her pet monkey on her shoulder and her pet Aztec hairless dog, Señor Xólotl, in her arms. This doll required a great deal of detailed embroidery work and her ornate hairstyle is also painstakingly rendered with an actual twist of beads and ribbon. She took a long time to make! These dolls are for decoration only. They are too delicate for young children. Background objects in photographs for display only, not included. Please contact me with any questions!